The gridiron gang are making their way back to the field as players prepare for the upcoming season. W.R. Myers Rebels started their training camp earlier this month and the team is starting to take form as players ready themselves for the start of the season. 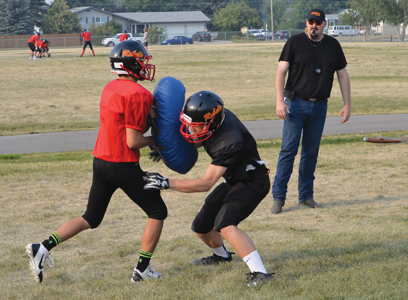 After a provincial semifinal loss at the hands of Willow Creek at the end of last season, the Rebels coaching staff once again expect the team to see plenty of success over the season. With plenty of returning players and fresh-faced talent, the squad expects to see the provincial title as an attainable goal for the end of the season. “I definitely like our chances to contend for a title again. We have 11 returning seniors, and that group includes league all-stars in Brett Andrus, and Ashton Werewka, starting quarterback Mike Sawatzky, receiver/linebacker Kadin Reynolds, two-way lineman Corny Howatt, last year’s interceptions leader Johnny Tams, plus a few other key starters. Bundle that with some key incoming grade 10 talent, a solid group of second-year players, plus a few new faces that have been pleasant surprises, and I think we have the makings of a formidable team. We’ll need it though. Our league happens to include the defending Tier 4 provincial champions, in the Willow Creek Cobras. They’re the only team that beat us last year, and I expect them to be just as formidable this year,” said Rebels head coach Jason Jensen. Jensen, who took over head coaching duties this past spring, also says the coaching staff will see plenty of new ideas as they have gained a few new additions to the staff. One of biggest additions to the coaching staff will be running the offensive side of the ball and with the familiarity already in place between not only the coaching staff but the players, Jensen sees plenty of touchdowns in the Rebels future. “We’ve had a bit of a shake-up on the coaching staff, with offensive coordinator Quintin Cheverie moving on to another opportunity, and longtime Rebels bantam coach Garrett Simmons stepping up to fill that role. I coached with Garrett for years at the PeeWee and Bantam levels, and we had a lot of success together, so bringing him in was a no-brainer. So far, the boys have really taken to Garrett’s offence, which shouldn’t be a shock, since most of them played for him when they were younger. I think our offence is going to be pretty electric,” explained Jensen. Even though Jensen took on the head coaching duties, he will also continue his role as the defensive coordinator for the Rebels for the 2018 season. “I’ve stepped up into the head coaching role, with (former head) coach Adam Hughes taking a bit of a step back to help with his son’s Atom football team. I’ll also continue in my current role as defensive coordinator, with Adam handling special teams duties,” said Jensen. With school starting next week, the football season gets a leg up as the Rebels will see game action this weekend when they hit the road. Even though it’s the first snaps of the 2018 season, the Rebels will be in tough as they face off against a team who was top five ranked in Tier 4 last season. “We open the season on Saturday, September 1, with a road trip to Canmore, to face the Canmore Wolverines. Last season, they were a top 5 ranked team in Tier 4, as well as Provincial quarter-finalists, so I think this will be a good test for us to start things off. This should kind of tell us where we really stand on the provincial stage in our tier,” added Jensen. Things won’t get any easier as the first leg of the season will be tough test after tough test for the W.R. Myers squad. Even tougher might be the fact they start off on the road for a two-game swing before heading home to Ken McDonald Memorial Sports Park. “From there, we move on to play Catholic Central High School on September 7 in Lethbridge, before our home opener on September 15, against Calgary’s Rundle College. CCH is a perennial Tier 2 contender, and Rundle was the team we narrowly beat in the Provincial quarterfinals last year, so that’s 3 tough games to start the season,” continued Jensen. The tough tests to start the season may be a negative for some, but Jensen and the Rebels team welcome the challenges they present. Facing strong teams right off the get-go is something Jensen hopes gets the squad prepared for the playoff games further along in the season. “They say steel sharpens steel, and we’re going to put that to the test early. My hope is that a tough early schedule galvanizes us as a team, and has us firing on all cylinders when we get into our division games, and league playoffs. I’m confident we’ll have another deep playoff run, but of course, we have to play the games first,” he said. The W.R. Myers Rebels will play their first home game at Ken McDonald Memorial Sports Park on September 15 at 1 p.m. when they match up against Calgary Rundle College for an exhibition game.